The 1820's was a time of expansion in the colony. The surveyors were pushing into new horizons beyond the coastal strip, and both farming and grazing country were in great demand. The wide open plains in the Merriwa area greeted the early white explorers, and this news quickly reached the ears of the colony's wealthiest men in Sydney. Land was quickly snapped up in the area, by the likes of John Blaxland in the 1820's, and he was soon followed by James Brindley Bettington, W.C.Wentworth, George Wyndham and others in the early 1830's. The land is well-watered by several creeks, and it is suitable for either raising livestock or growing crops, as it is very fertile. The composition of the soil is thick and black, which turns to sludge in heavy rain, making it horrible stuff to be bogged in! In more recent times, Merriwa has become particularly noted as an area for raising sheep, and for the production of fine wool. The wealthy grantees who came first, left overseers and workmen on their land, who had to cope with isolation and primitive conditions. Then in the late 1830's there was a shocking drought followed by the "Hungry Forties" depression. Land lost it's value, banks failed, and sheep were boiled down for tallow. Some of those who couldn't cope, then drifted back into the coastal towns and swelled the numbers of rural poor in those places. But for those who stayed, there were better times ahead. In 1839 a village was laid out and given the Aboriginal name of Merriwa - meaning grass seeds. However nothing much happened there for a while, due to the atrocious economic conditions prevailing. 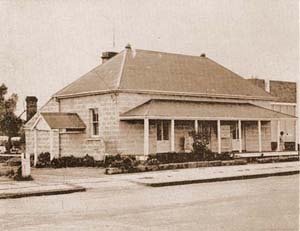 Nonetheless, a few private dwellings were established, and in 1845 a post office was constructed. 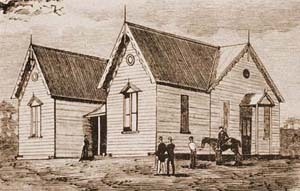 Then in the 1850's a school, a couple of churches and a courthouse followed. By 1851 there were 20 houses. However by 1858 there were three inns, five stores, two blacksmiths and an assortment of carpenters, builders, saddlers, tailors etc. servicing a population of over a hundred people. The town grew steadily through the mid 1800's, but the bypassing of it by the railway until 1917, meant that it suffered at the expense of the towns further east, like Muswellbrook. Those who were employed by the Bettingtons at Brindley Park, were living in a virtual town - they were given rations and accommodation, and the children were schooled on the property. Mr J.B.Bettington was appointed a member of the Legislative Council in 1850, and remained a member until his death in 1857. The main street is named Bettington Street in his honour. Merriwa is really a town that rode on the sheep's back. Bullock-drawn wagons with huge wool bales had been a common sight in the early days, and then trucks took their place. However, in recent times, the drop in wool prices has led to the development of newer industries like tourism, and the growth in crops like olives and grapes. However there are still some sheep, cattle and the traditional wheat crops to be found. For further information on the history of Merriwa, please refer to "The Lure of the Land" by Helen Bettington. Today Merriwa is a pleasant country town, with less of the bustle it might have had at the height of its prosperity brought by the era of the golden fleece. This makes it a great getaway for jaded city-dwellers. For the nature-lover there is the Goulburn River National Park nearby, for bush-walks and for enjoying the abundant wild-life and trees. Camping is possible there, or at the caravan park in town. There is also the spectacular Widden Valley, where the cliffs and general scenery is spectacular. There are also plenty of hotels, motels and bed and breakfasts in the general area, so you can be assured of a pleasant stay.